We worship on Sunday mornings at 10:30 (9:30 from the beginning of June through Labor Day). 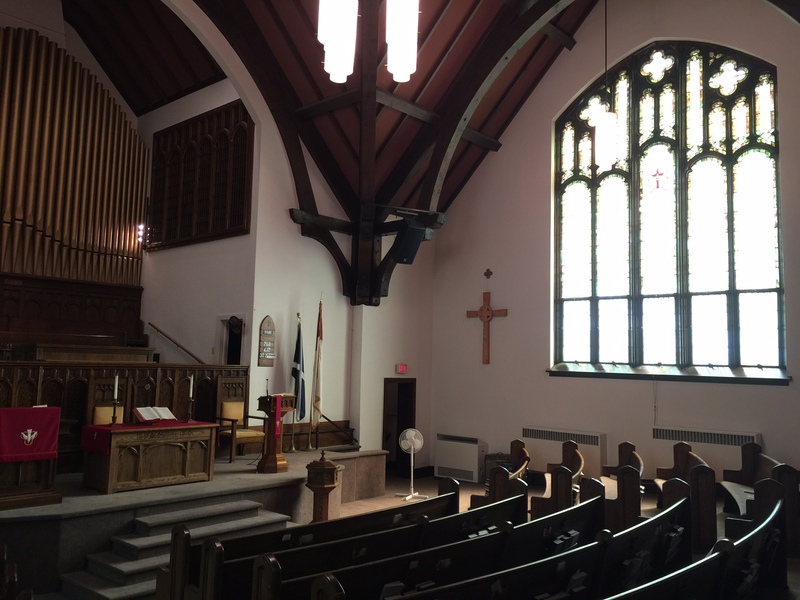 Our service is informal and semi-traditional – we have an organ, a choir, and a worship leader, but we don’t stand on ceremony. We take a joyful, creative, thoughtful approach to God. We celebrate the sacrament of Communion on the first Sunday of the month, and our table is open to all people. Each service includes a Children’s Time, followed by an activity time during the adult sermon. Children are more than welcome throughout the service, or our nursery is available if that will be more comfortable for you. A volunteer attendant can meet you in the nursery at the beginning of worship, or one of our ushers can help you find someone. We now have a new sound system complete with hearing assisted devices! If using a hearing assisted device will make the worship service more enjoyable and meaningful for you, an usher would be happy get you set up with one. Our dress is mostly casual. You’ll find a couple people in jackets or skirts, some in blue jeans, and many people somewhere in between. The sanctuary is not air conditioned, but considering the climate that’s not usually a problem! Following worship each Sunday, we gather in the South Room at the back of the sanctuary for coffee and fellowship. You’re very welcome to join us! Our church building is located at 5th Avenue and 2nd Street South in Virginia. Limited off-street parking is available behind the church. On weekends, you can park in the lot north of the public library across the street. If you’re able to walk a bit, please leave the closer parking spots for those who need them. Be aware that most entrances involve a number of stairs. If you would like to use the chair lift, please call ahead and we’ll be ready to assist you. Thank you for joining us. If you come as a visitor, we hope that you’ll leave as a friend who’s been blessed by worshiping in this house of God. We invite you to join us again.